Many users said that the Adidas Nemeziz 17.1 Firm Ground is comfortable right out of the box. A majority of players mentioned that this football boot fits like a glove and does not need many break-ins. The Adidas Nemeziz 17.1 Firm Ground provides good lockdown, as described by a lot of users. According to many reviews, this football shoe provides a great touch on the ball. Several fans noted that the Torsion Frame outsole matched the movement of the foot closely. A good number of users who used the Adidas Nemeziz 17.1 Firm Ground said that it provides good traction even on wet ground. A few footballers observed that this football boot is helpful in making them feel light and quick on the pitch. The fresh design of the Adidas Nemeziz 17.1 Firm Ground is lauded by plenty of users. A lot of users were disappointed because the Adidas Nemeziz 17.1 Firm Ground gave them blisters in the heel area. A couple of players mentioned that the outsole rips off from the football shoe. A small percentage of purchasers noted that the surface was damaged after using it for the first time. A few users noticed that the lace sockets rip out easily. One user complained that this football boot lacks bridge support. Some players felt that the Adidas Nemeziz 17.1 Firm Ground runs small. The Adidas Nemeziz 17.1 Firm Ground sports a modern design that is well accepted by a lot of young footballers. Most reviewers were impressed by its glove-like fit. While this football boot has received numerous positive feedback regarding its style, fit, and ball touch, a majority of players were also disappointed because they kept getting blisters in the heel. Overall, the Nemeziz 17.1 is a great choice for a comfortable experience in the playground, whether or not you are a Messi fan. Adidas introduced the new deadly model in two available options: laceless or classic one with the lacing system. No matter which one you choose, you will get that deadly look, which is supported by the newest technologies that could be presented on football shoes. In this review, we are going to discuss Adidas Nemeziz 17.1 FG with laces, worn by many great players out there. When it comes to the look, we don’t have many things to complain about when it comes to this model. It is just perfection for itself in every way possible. From the first look, I fell in love with them, and no matter how many other pairs were around in the shop, my focus stayed on them. I like the combination of colors. It is not too dark, nor too vibrant and annoying. It is easy to keep them clean and also using marks are not visible as much as on other models. Also, I need to mention as a fan, that I really like and support the idea of one piece construction. I like the design and I felt good while wearing them. It is important to mention that this model looks almost identical as 17+ laceless model, and there is no huge difference in performance at all. There is only a difference in design, which have to be presented because of the laceless system. The Agilityknit upper is the name for the newest technology presented on this model. Like on every model, first few wears are always stiff, but with time everything softened up, and then you have nice light synthetic fell on the ball. The dual lock collar is also something new on Adidas models. It has a role to provide you with great stability and lockdown while playing, which worked fine for me since I was not happy with the fit of the boots. There is also padding system inserted inside of the boots to provide some extra comfort on sensitive areas of the foot. Torsion frame is the name for new soleplate presented on this model. Soleplate is made out of small Torsion Ribs which provides stability and flexibility. Personally, I like the work that Adidas did with this model, and I highly rate it. I was highly satisfied with this soleplate. I like the studs, and no matter which conditions I played on, I always felt good and stable. This is my first Firm Ground boots and I use this model because I feel that it is working well. The scenes in the video clip below will tell you everything about this model. The lacing system is always improving. Like expected, we can also see changes in this model not only on the holes and laces. Everything is structured precisely and should provide you with great lockdown. The only negative experience I had is after dueling with another player. My left laces have broken up, but luckily I used the electric yellow ones from my old F50 AdizeroPrime, which later looked even better. There are double holes in every side. Absolutely, no cons when it comes to laces. What I like the most is the lightness of the boots. It really feels like you are wearing only socks. They remind me of good old days when I was wearing F50 Adizero Models. This lightness and softness are really something that I adore. I also felt good, while playing in them. From shooting to passing I had zero problems. Traction is also great, and that is maybe the best thing on these boots, however, the durability is something that disappointed me the most. Even the material by itself looks great, and on first sight, there is nothing suspicious, after "FIRST" training session they ripped off. Since this is not the case with boots that cost 220 Euros, I hurried up immediately to change for a new pair. Even sellers were in shock. I had small troubles but I managed to get a new pair, and again very soon they ripped off again. I went to a shoe repair shop, and their comment was that it is not cost-effective to repair them. So because of durability, I am not going to remember this model with good memories. Another thing that I am not happy about is sizing. Usually, I am happy with Nike 44 EU, and I find myself most comfortable in that size. I tried two models size 43 1/3 EU which seemed too small and stiff for me, so I decided to buy 44 EU, even I did not feel great fit. By the time, as expected I was not satisfied with the sizing. Many times I did not felt full lockdown. I felt like there is 0.5cm extra length of the shoes. I always had to tighten them up a lot which sometimes resulted with bad circulation and pain. With my experience, I would suggest you go with a half-size smaller model. The upper is really soft and comfortable. There’s not too much to break in. One little issue that I had was getting chaffing at the back of the heel. It fits quite well with the same general shape as the entire Adidas brand. The one-piece design is nice and seamless as well. Its soleplate feel very flexible and moves naturally with the super soft upper. As far as the stud pattern, the half circle-shaped studs feels more unique than other studs from Adidas. The biggest difference between the two shoes is what you can clearly see across the top of the foot. The 17+ features the Agility Bandages. On the 17.1, instead of having the straps all the way through the middle, it has a thin elasticated material and a lacing system. The laces are very effective in terms of locking your foot in place. Both shoes feel identical in terms of touch on the ball. Right off the bat, i think the 17.1 is better with the lacing system for better adjustability and superior lockdown in general. The only difference between the two boots is the material in the middle. As far sa tech-specs go, the 17.1 and the 17+ are virtually identical. I like the stud pattern of these shoes out of all the stud patterns from Adidas because of its half circle-shaped studs. 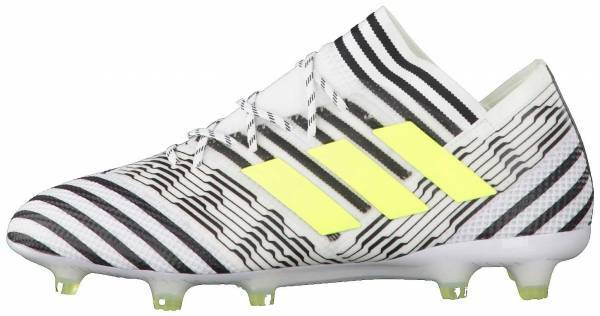 The Adidas Nemeziz 17.1 FG features the new Agility Bandage on the upper as well as the Dual Lock Collar construction around the ankle to provide good lockdown. The 360 Torsion Tape molds with the shape of the foot providing comfort right out of the box. This football boot also uses the new Agility Knit 2.0 on the forefoot and the heel areas. This soft, adaptive material offers additional responsiveness to the shoe. The upper is equipped with the Non-Stop Grip (NSG) technology that acts as a wet control element. It is also seen in other Adidas models such as the Adidas Predator 18.1 Firm Ground and the Adidas Predator 18+ Firm Ground. The lightweight Torsion Frame outsole with the Torsion Ribs follows the movement of the foot nicely. The Adidas Nemeziz 17.1 FG provides a snug fit because of the presence of the Agility Knit 2.0 in the forefoot area. The shoe is available sizes 7 to 13 for men’s and 5 to 10 for women’s versions. The shoe runs true to size. The Adidas Nemeziz 17.1 FG uses the Torsion Frame technology for its sole plate. It has Torsion Ribs on the midfoot area that allows the shoe to match the movements of the foot. It also provides an excellent push off for added agility. There are three bladed studs on both sides of the forefoot, one in the middle, and four at the heel area. Designed for firm grounds or referred to as FG, the studs are made to give a little more aggression when pushing off. The structure of the Adidas Nemeziz 17.1 FG upper is made up of the Agility Bandage. It is composed of multiple strips of Torsion Tapes that are sewn seamlessly together. It offers improved lockdown and mobility that are useful when sprinting and changing directions. The forefoot and heel areas of the Adidas Nemeziz 17.1 FG are made of Agility Knit 2.0. The upgraded version of this adaptive material is now thinner and more flexible. It provides a lightweight feel on the foot and a direct soft touch on the ball. The Agility Knit 2.0 material at the back of this football shoe is backed by an internal heel counter with a ton of padding to prevent heel slippage. The upper is also covered by a layer of polyurethane and the Non Stop Grip or NSG technology. These materials prevent the football cleat from getting wet. Also, the NSG is a thin layer of ridges that increase the shoe’s contact and traction with the ball, especially in the forefoot area. Internally, the Adidas Nemeziz 17.1 Firm Ground has a synthetic suede, padded liner that prevents the football boot from feeling overly thin when worn. The tongue is replaced by an elasticated material which stretches and compresses to the shape of the foot when worn. The shoe also has a shallow lacing system that runs through the center. It gives this soccer shoe more responsiveness and prevents your foot from sliding around. The Adidas Nemeziz 17.1 FG also comes with a Dual Lock Collar construction. It provides a secure lockdown and stability in the ankle area. On the underside of this extended bandage are silicon dots that prevent it from sliding and bunching up. The removable insole is a solid layer of white foam that has a mesh liner on top. It also has some perforations through the forefoot and heel areas. Lionel Messi wore the Adidas Nemeziz 17.1 FG during the Copa Del Ray final. Another football player who wears the shoe is Thomas Lemar. The design of this football boot took inspiration from the ancient ritual of wrapping and taping the ankle to provide additional strength and agility. Adidas Nemeziz 17.1 fans can have a personalized pair of this football cleat with their name and flag on it. It also has a kid’s version. 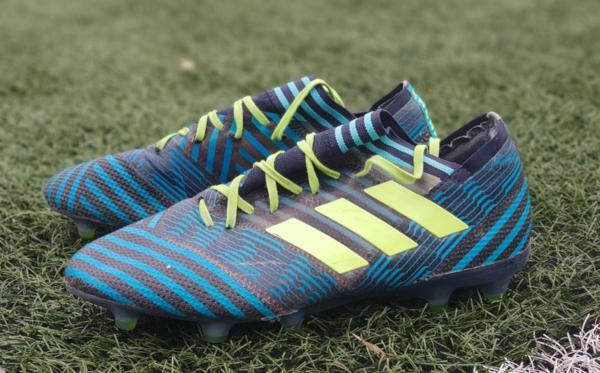 This football boot model is updated in the form of the Adidas Nemeziz 18.1 Firm Ground.